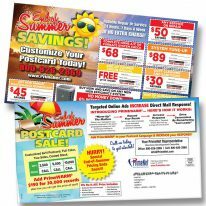 You can increase End of Summer returns with a highly visible strategy: Mailed Postcard+Targeted Digital is the way to go! Make your message visible to potential customers in the same geographical areas as your mailing just prior to and during delivery to increase your brand visibility. relevant audience on premium websites! Mailed Postcard + Targeted Online ads have an average lift rate of 25%+! • 11″x6″ Postcard, Full Color, Glossy Cover Stock, 2 Sides. 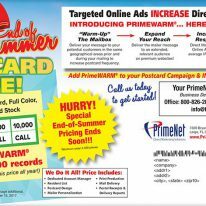 • Add PrimeWARM® for ONLY $190 for 30,000 Records! 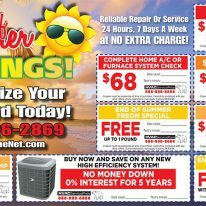 Ask how you can get PrimeWARM special pricing ALL YEAR LONG.